Clones whisper of ChiLo as a promised land of freedom. This is one of those cards that suffers from the problems of positional ice. Here's the ideas you can test for yourself with it to see what I mean. 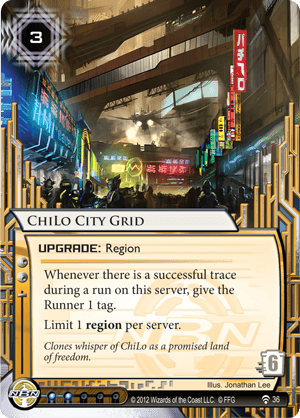 ChiLo-Overload: The trace on this card is not a sub, so they can't break it. Sounds good right? And the card needs tags to have subs, so that works too. If they fail the trace, you've tagged them not once, but twice! And STR 4 means that it's a little harder to break, I mean at least they need a Datasucker token or need to pay to pump a Switchblade or whatever. Solid, right? Trace 1 is a little rough on a corp. Think about how many good runners have 1 on the id. I mean, unless you have money to burn as a corp, this is not a trace that will expect to win often. Plus 3+6 to rez both... Corp is losing money and Runner just has to run smart. So perhaps what we need is something cheaper? ChiLo-tenberg. Run R&D get two tags. 5 total to Rez, on R&D pretty rough to break. 2 tags every R&D run. Of course not a bit of it works until you have Gutenburg in place and it doesn't work so well off R&D, but Sync can make 2 tags very taxing and needs fewer cards to make a deck anyway. You now have a pretty solid tax on runners getting into R&D. You could also get a lesser version of this on Chi-Hunter or Chi-Virgo that works out of R&D and Making News can help you actually afford a trace or two at that cost of making the tags tax. Now the question... was Chi-Lo ever integral to this? No. If you really want to find these cards on time, you need at least 2 of each, but you might go for 3. And except for trashing resources you still don't have any tag PUNISHMENT in these cards and that will add cards you will need slots for. In other words, when you find yourself running out of card slots, the first thing you cut is the Grid. Keep on reviewing early card with no review yet tonight. This last one and every card until Trace Amount are reviewed, and then I go to sleep. Err, well... Never mind about this one so much, and never seen it played as far as I remember. upgrades slots are tight, and NBN certainly prefers SanSan City Grid in-faction, with sometimes Ash 2X3ZB9CY out of faction. while not very popular either but still a little more, Bernice Mai offers a similar effect. NBN has many good tracer ices that give tag, so why bother ? There are some NBN tracers that don't give tag, but there's not that good (either expansive, low trace value or with clanky effect). Other factions sometimes have good non-tagging tracers, they rarely seek to tag during run. So again, why bother ? all in all, it's preferable for the Corp player to tag the runner during his or her turn if they want to something of that. NBN have SEA Source and Psychographics for that, and other Corps would better import one of them. Maybe I've missed something about this card, but if someone has ever found, they didn't tell either.